Food is a glorious thing in that it connects people unlike anything else. It also takes you places in a way that you can enjoy though taste without physically being there. I guess that's why I enjoy hosting themed dinner parties with friends and I especially like highlighting various cuisines. The most recent themed dinner party I hosted was focused on the food of Spain. 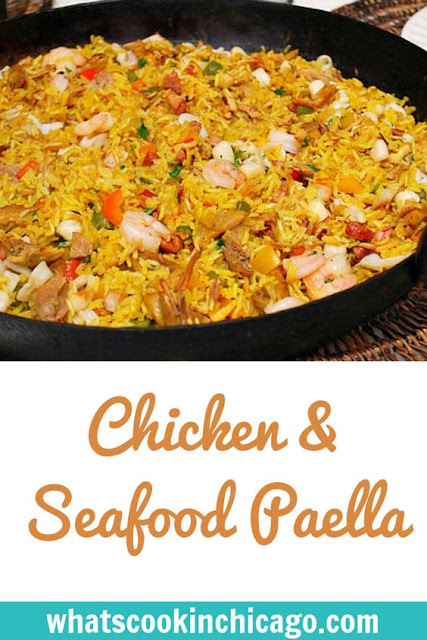 The star of the dinner was this paella that I served right out of my Lodge CRS15 Seasoned Carbon Steel Skillet, 15-Inch Paella Pan - 15" (Google Affiliate Ad) at the table. It was quite a presentation and the fact there were no leftovers is clearly a good sign it was well received by all! If you cannot find dried Spanish chorizo, feel free to substitute it with Andouille sausage. The recipe also calls for saffron. Yes - it is the most expensive spice there is, but the good thing is only a small amount is required and it really does make a difference in the dish. The seafood mix I used was found in the frozen section of my grocery store. It includes shrimp, baby scallops, and calamari rings... but you can also use all shrimp instead too. Sprinkle chicken with rosemary, 1/2 teaspoon salt, and black pepper. Heat the oil in a large nonstick skillet over medium-high heat. Add chicken; cook 3 minutes on each side or until lightly browned. Remove chicken from pan and cool enough to handle. Remove from bones; cover and keep warm. Add diced sausage to pan; cook 1 minute. Add onion and bell pepper; cook 7 minutes, stirring constantly. Add rice, tomato, paprika, saffron, and garlic; cook 1 minute, stirring constantly. Return chicken to pan. Add broth and 1/4 teaspoon salt; bring to a boil. Wrap handle of pan with foil; cover pan. Bake at 400° for 10 minutes. Stir in seafood mix and peas. Cover and bake an additional 5 minutes or until seafood is done. 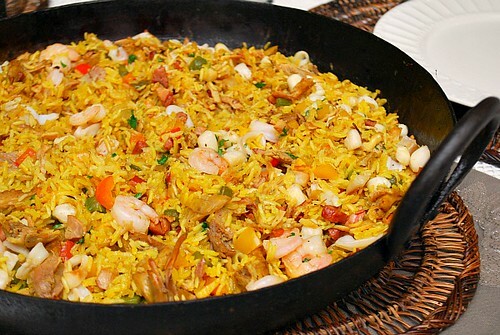 Note: Saffron, the exotic spice with a distinct, earthy flavor, gives this Spanish dish its characteristic yellow hue. It's a bit soupy when first prepared but quickly absorbs the liquid.